News About "Courting My Muse"
I have joined FACEBOOK, because apparently I did not have enough online pages and communities to keep up with. You may find me there as Mary Carolyn Phillips Crowell. I am still selling COURTING MY MUSE through CDBaby.com as well as Amazon. If you live near the Athens, AL area you can purchase it at Pablos on Market in downtown Athens, AL. Several filk dealers sell COURTING MY MUSE at the conventions they attend. And if I am performing at a general science fiction convention I get copies of my CD to one of the dealers there or sell it myself. Feel free to contact me via MYSPACE or FACEBOOK about COURTING MY MUSE if you'd like! In November I played again at the Donnell House for their Festival of Trees Preview Party Each room of the Donnell House was decorated in a different theme. One was clocks (several different types of clocks displayed,) and I played in the 'camera room' which featured a table-top history of photography and equipment. The food was extraordinarily good! They feed their guests (and their pianists) well. :-) I also played inside Pablo's On Market on November 23rd (It was too cold to play outside.) as part of the Spirit of Athens Holiday Open House. Everyone was cheerful and busily shopping for Christmas, and the latte afterward was delicious! Joyeuse13 (pictured here as Jessica Rabbit, photography byNeil Cajuin Dronet) also caught some of our Three Weird Sisters' concert. This is a snippet of Brenda Sutton's song, "These Two" which will be appearing on our album, Third Thyme's The Charm. Anyway, the concom runs an amazing and well-organized convention at FENCON, and I definitely want to return. 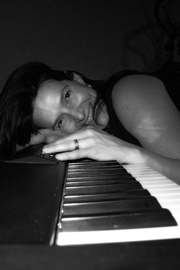 Next year's musical guest is Carla Ulbrich, a wickedly funny comedienne and excellent musician. Play It With Moxie performs for Gafilk's Saturday night banquet every year, and this year was no exception. Check out Play It With Moxie's Myspace page, Teresa created! I wish I could give you more convention highlights, but we held several rehearsals before and during the convention, that I was wiped out after we performed. Debbie Ohi has this to say about Play It With Moxie. And Dave Rood explains what goes into a Play It With Moxie performance. Also, http://magnusretail.com is about to get a radical new look! More on that soon.